The Pakistani government on Saturday sealed the troubled Lal Masjid in Islamabad, a day after a suicide attack killed 15 people during clashes between Islamic extremists and security forces following its reopening. Hundreds of policemen set up new checkpoints and cordoned off the area around the compound with barbed wire. "The mosque will now remain closed for an indefinite period," Interior Ministry spokesman Javid Cheema said. Security in Islamabad was also strengthened to thwart possible attacks by Islamist radicals. Police were deployed at all entry and exit points of the capital and the nearby city of Rawalpindi, where security forces were put on high alert. The authorities had carried out reconstructive surgery of the head of the suspected suicide attacker to make his face recognisable, while other parts of his body were sent to the laboratory for DNA testing. The bombing targeted a group of policemen deployed near the Red Mosque to quell an irate mob of some 2,000 Islamic theology students who occupied the compound for several hours after it reopened for Friday prayers. The police used tear gas to disperse the crowd and arrested around 100 rioters as it regained the control of the mosque compound. The Mosque was central to the CIA / NSA effort to radicalize an Islamic insurgency against the Soviets in Afghanistan. This effort began in 1979 under President Carter and his National Security Advisor, Zbigniew Brzezinsky, and grew much larger during Ronald Reagan's presidency. The mosque itself has been a source of pride and the recipient of much official support. By some accounts it served as a launching pad for the Taliban, who with the help of Pakistan's army and its intelligence service (the ISI), wound up evicting the Red Army and controlling Afghanistan. But the relationship between the Pakistani government and the Taliban changed drastically shortly after September 11, 2001, when Pakistan -- which many intelligence analysts see as one of the world's primary sources of terrorism -- reputedly became America's top Asian ally in the so-called Global War On Terror. So -- if we believe the official tale on this point -- Pakistan has been, in effect, charged by the Americans with the responsibility of fighting a movement that it -- and the USA -- once supported. And Uncle Sam has been giving Pakistan at least $100 million a month for its "expenses" in fighting the GWOT, but the Pakistani Army has become increasingly reluctant to attack its former friends, and a "peace settlement" between the two was arranged last summer. But lately the Americans have begun to get a bit picky about this, and threatening to tie future aid to anti-terrorism "performance". All this background to the siege and eventual storming of the mosque complex is quite often overlooked in the rush to tell the story of the day. And in recent days -- while we've been talking about other things -- Pakistani forces have been skirmishing with "militant extremists" in the mountainous northwest of the country, apparently carrying out attacks but also being ambushed from time to time, and nobody knows whether or not this has anything to do with the Americans talking of making the aid conditional, or whether it has anything to do with thinly veiled threats of military intervention coming from the State Department. But this is certainly a moot point to the families and friends of the people who have been killed. In the opinions of many, including your frozen scribbler, what we're seeing here is intimately connected, not only with the largely secret history of American-sponsored Islamic terrorism, but also with the future of global terror, as well as the future of the GWOT -- and these, unfortunately, are two very different things. I have argued many times here that the GWOT is "bogus", and many aspects of it certainly are that, but on the other hand there really are people who are willing to blow themselves to smithereens in order to kill 15 or 20 others. In Pakistan last year there were more than 650 terrorist attacks, in which more than 900 people were killed, and this year so far it's been worse. Much of the most serious damage has been caused by suicide bombers. So this wave of suicide bombings -- horrific as it is -- is nothing new for Pakistan, and as you can see there's no trace of surprise or emotion in the reports of "reconstructive surgery of the head" of the suspected attacker, "to make his face recognisable" ... after he killed 15 people and injured another 70 in the heart of the national capital! Can you imagine what would happen if a suicide bomber had killed 15 people in Washington, after the government had attacked a church-school complex, which until relatively recently had been politically "connected" ... and Americans think we know what it's like to live under the constant threat of terrorism! What we know is what it's like to live under a constant barrage of propaganda. And an investigation into yesterday's bombing has begun. 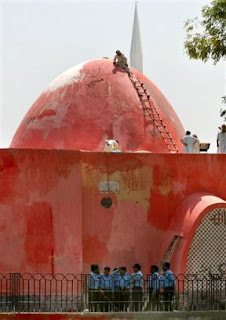 And the Red Mosque is closed indefinitely. But the Taliban will not be shut down so easily.